“The success of any clinic or demonstration inevitably comes down to the quality of the PA system. The Horse Trainer is very simple, very compact and the quality is unbelievable. It's fantastic." Clayton Fredericks, World Number 1 FEI 3-D-E rider rankings 2007, Individual Silver Medallist World Equestrian Games. Got something to shout about? Try speaking to your audience with the Horse Trainer P.A System. This unique system is smallest, lightest, most powerful system for its size currently available anywhere in the world. Communicate with 1-100 people over a 60-100m area from the comfort of your saddle or on the ground. Ideal for lectures, demonstrations, pony club rallies, competitions and training clinics, Horse Trainer P.A allows up to 3 spokespeople to talk clearly to their audience. Built-in CD system and hand-held radio or headset mics are also available to enhance your presentation. Designed for non-technicians, you can be setup in just 5 minutes, running the system from the mains or from the built-in rechargeable battery, making it ideal for mobile applications. 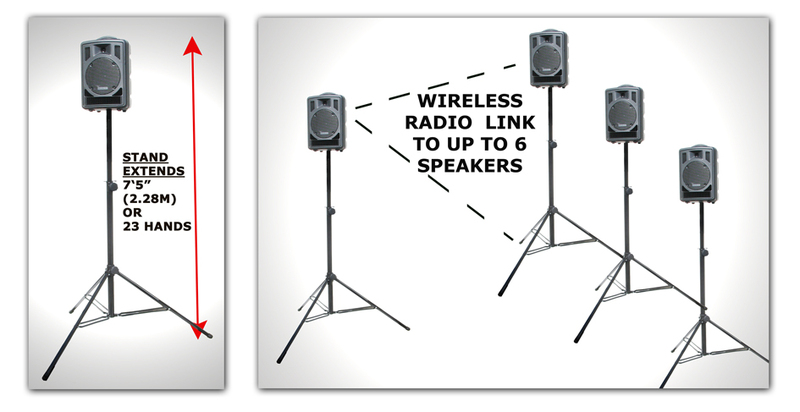 For larger audiences, up to 3 additional speakers can be linked together via the wireless audio link. Picture above: PA is supplied with A. Wireless transmitter with headset and lapel mics. Wired hand-held mic, 4 x rechargeable batteries and charger (240V/UK plug) and B. Hand-held wireless mic. Everything is built into the back of the P.A unit - picture above shows CD player, 2 x wireless receivers, wireless link to other speakers. Horse Trainer PA Price: £1589.00 incl. free UK delivery and Picture A and B contents above, protective PA cover, speakerstand and bag. Wireless Slave unit (no CD) Price: £779.00 incl. free UK delivery and protective PA cover, speakerstand and bag. Please note prices shown are for payment by debit card. Credit cards will incur an extra charge. The Horse Trainer P.A System will pay for itself in no time, especially if rented out to other riding schools and clubs. © Soundriding.com. All rights reserved MMXVII.